90 minutes. 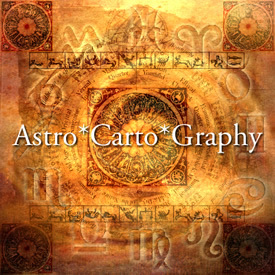 Personalized Astro*Carto*Graphy plus Natal Chart. Get your BEST PLACES and understand where you are now. Includes 10 or more pages of personalized maps. LIVE where you’re supposed to live and DO what you’re meant to be doing. 60 minutes. Birth Chart and AstroCartoGraphy locations. Where to live or travel to. 30 minutes. Any Question(s). Relationship. Work. Family. Timing of a move. Important decisions. Clear Direction on Your Life Purpose. Program includes ONE 90 minute VIP session plus FIVE 60 minute sessions. Email support and access to any software reports.